Our virgin, unrefined, Grade A African Shea Butter is extracted from the Shea nut and left completely unrefined; therefore this lack of refinement, means that our Shea Butter retains its pale yellowish colour and has the typical odour normally associated with Shea Butter. Our Shea butter comes from Ghana. We sell only the finest organic African Unrefined Shea Butter, with no additives. Earth Elements Shea Butter is completely raw, unrefined and has a thick and often nutty aroma. This means that we do not use bleaches, deodorizers, or chemicals to change the scent or appearance of Shea Butter. Shea Butter that has been altered depletes the product of its healing and medicinal properties, as a result destroys the vitamins and minerals naturally present in Shea Butter. Shea butter is a popular ingredient in many cosmetic supplies, lotions, and other skin care products. Because Shea butter can improve skin elasticity, this nutrient rich butter is popular with both men and women. Today it is used as an essential ingredient in many cosmetic products. The properties in Shea Butter can also block the sun's ultraviolet rays. You will often find it as a major ingredient in sun block products, lip balms, and lip gloss. Shea Butter can also be used as an anti-inflammatory and humectants which makes it very useful in medicinal ointments and creams. 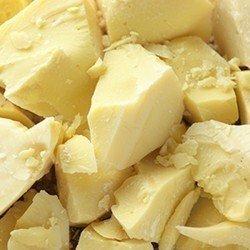 Shea butter is an extremely efficacious, moisturizing multi-purpose butter suitable for all skin types. Widely recognized as a superb moisturizer with exceptional benefits for the skin. The unique properties of shea are evident in the name of the tree it comes from; the west African Karite tree, meaning Tree of Life. A small amount of impurities and sediment (bits of plant fiber and husk) may be present. Batches may vary in color and this product may contain white patches and darker streaks which are normal. Shipping: Kindly note that orders for 2kgs and more will be sent via road freight and will be delivered within 3-4 days from date of payment.